The GranTurismo Sport improves on Maserati’s tradition of offering rich sporting character and high performance while also delivering comfort for four adults and effortless elegance and sophistication. An evolution of the GranTurismo S and the GranTurismo S Automatic, the GranTurismo Sport delivers a range of technical features that enhance its sporting character, both inside and out. Unveiled at this year’s Geneva Motor Show, the GranTurismo Sport has been designed to stand out from the coupe market with aerodynamically efficient design upgrades derived from the MC Stradale. While its headlight shape remains the same, Maserati has fitted them with new lighting technology, including LED Daytime Running Lights. Capable of sprinting to 100km/h in only 4.7 seconds and reaching 300km/h, the GranTurismo Sport carries the latest evolution of Maserati’s all-alloy, 4.7-litre V8 engine, boasting 338kW (460CV) of power. Available with both six-speed automatic and electro-actuated transmissions, the GranTurismo Sport also delivers a new generation of the Sport Skyhook active damping system and dual-cast brakes for maximum stopping power. 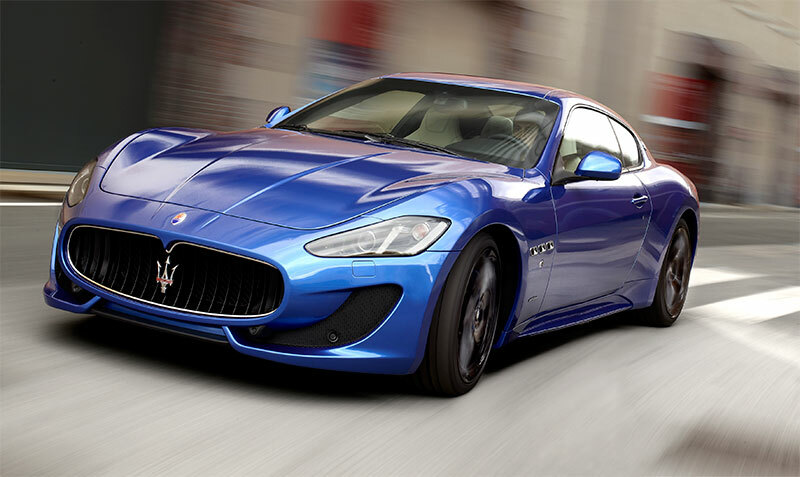 It sits between the GranTurismo and the GranTurismo MC to provide the mid-point of the GranTurismo model range. The GranTurismo Sport carries on the traditions of the GranTurismo, which has been one of the most successful cars in Maserati history. Since its launch at the 2007 Geneva Motor Show, around 15,000 GranTurismos have been delivered all over the world. Last year the 2700 GranTurismo sales accounted for 44% of Maserati’s total. The United States was once again the leading market with almost 900 GranTurismos sold in 2011, followed by China and Italy. Already one of the most celebrated designs in the sports car world, the restyling of the GranTurismo Sport’s bodywork perfectly blends hints of the MC Stradale with the precise sharpness of the GranTurismo. One of the most noticeable areas of change is the GranTurismo Sport’s new headlight treatment. While it retains the external shape of the headlights, they now carry all-new internal technology, including the addition of Daytime Running Light LED technology. The Xenon cluster within the headlight also incorporates Adaptive Light Control to track the movement of the steering wheel up to 15 degrees. It carries a more-pronounced dynamism in its aggressive nose, thanks largely to changes designed to improve both the aerodynamics and the front brake cooling. This includes the addition of a new central front splitter, dramatic cuts leading from the leading edge of the headlight to the top of the grille and integrated parking sensors. The chromed Trident with red accents takes pride of place at the centre of the grille: a detail always reserved to the most powerful Maseratis, in keeping with the tradition of the marque. Side skirts are also standard on the GranTurismo Sport, which increase its aerodynamic efficiency, along with enlarged side grilles to extract hot air from the engine bay. At the rear, the GranTurismo Sport also adopts a 20 percent darker tint for its tail lamp covers. Upgrades to sportier front seats and the adoption of a flat-bottomed steering wheel have given all GranTurismo Sport occupants even more knee room and leg room. While the GranTurismo’s interior has always been the perfect amalgamation of athletic prowess and luxury craftsmanship, the GranTurismo Sport has been given a performance makeover. New front and rear seats not only improve and update the GranTurismo Sport’s look, but also provide better support as well as optimised comfort for the driver and passengers on longer journeys. Maserati’s goal was to redefine the balance between comfort and performance for the GranTurismo Sport, and the addition of more body-hugging seats with integrated headrests adds sportiness without compromising its luxury character. The distinctive new design for the rear shell of the front seats, in leather, frees up more than 20mm more space for rear seat passengers. The steering wheel is also new and is now more ergonomic and better suited to sports driving, thanks to a flatter rim and an accentuated grip profile. New interior details in EcoChrome grey and the Poltrona Frau leather upholstery feature alongside standout existing features, such as the gearshift paddles on the steering wheel and the aluminium pedals. Both the Automatic and Electro-Actuated versions of the GranTurismo Sport are faster than the outgoing GranTurismo S. The GranTurismo Sport, with its Electro-Actuated gearbox, is now capable of sprinting to 100km/h in only 4.7 seconds. This is an improvement of 0.2 seconds over the GranTurismo S.
Its top speed has also risen and the GranTurismo Sport is now able to reach 300km/h, the benchmark speed that approaches supercar performance. With the Automatic transmission, the GranTurismo Sport can accelerate to 100km/h in 4.8 seconds. Again, this is a 0.2-second improvement over the Automatic version of the GranTurismo S. It is also faster than its predecessor, achieving a top speed of 298km/h. Engine With a thoroughly modern V8 engine that has already become a classic, the GranTurismo Sport takes advantage of advances in engineering to deliver extra power and torque. It introduces important changes to both the engine’s software and its hardware to lift power by up to 20CV and torque by up to 30Nm with no fuel consumption or emissions penalties. The GranTurismo Sport will produce 338kW (460CV) of power at 7000rpm and a meaty 520Nm of torque, peaking at 4750rpm. The naturally aspirated engine’s maximum power and torque are available with both the Electro-Actuated gearbox and the fully Automatic transmission. This development means the engine output of the Electro-Actuated version of the GranTurismo Sport has risen by 10CV and 20Nm, VS GranTurismo Sport while the Automatic version has 20CV more power and 30Nm more torque than the GranTurismo S. The comprehensive upgrades to the engine began with the MC Stradale program, include new engine mapping, changes to the variable-valve timing management at high rpm and stronger pistons. These measures are combined with significant increases in the spark-advance to optimize the engine’s combustion parameters and the use of 98 RON fuel. Its core remains a 90-degree, 4691cc V8 engine that is fully balanced and uses five main bearings. The aluminium alloy engine contains a hardened and tempered steel crankshaft and its 32 valves are operated by chain-driven, double overhead camshafts. Unlike the GranTurismo S, both the Automatic and Electro-Actuated versions of the GranTurismo Sport fully utilize the same output from the 4.7-litre engine. The GranTurismo Sport’s oval exhaust tips generate an even richer sound. There is nothing artificial about it, either. 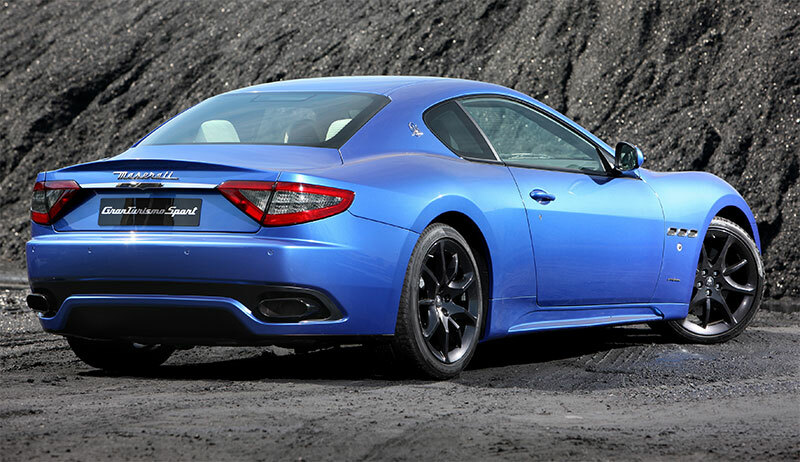 It’s the GranTurismo Sport’s natural engine note accentuated by switching on the Sport button. In the Sport-Manual mode, this diverts the exhaust gases down a shorter route to the exhaust tips, generating a richer, and more intense exhaust note. Utilizing the traditional transaxle layout, the Electro-Actuated gearbox is mounted in a single unit with the rear axle’s differential and is connected to the engine via a rigid torque tube. The six-speed gearbox receives the engine’s performance through a 20mm steel driveshaft, which is supported by four bearings inside the torque tube. It uses a double-plate dry clutch with a 215mm diameter and triple-cone synchronizers on the first two gears, a double-cone synchronizers on all other forward gears. While the gear changes themselves are hydraulically operated at the gearbox, they are selected electronically through the steering column-mounted gear levers. It distributes its drive to the tyres through an asymmetrical limited-slip differential, complete with 25 percent lock-up under acceleration and 45 percent lock-up on deceleration. The gearbox’s position ahead of the rear axle gives the GranTurismo Sport a front-to-rear weight distribution of 47:53. The ZF-built six-speed Automatic transmission has been upgraded to match the extra performance from the V8 powerhouse and has been derived from the transmission in the Quattroporte Sport GT S. Unlike the Electro-Actuated gearbox, the Automatic transmission attaches directly to the rear of the engine and sends torque to the same limited-slip differential through a two-piece, 69mm steel drive shaft. It’s a transmission containing a wide array of features that have been proven in other Maserati models, including five available operating modes. It can be operated in Auto-Normal, Auto-Sport, Manual-Normal, Manual-Sport and Ice modes. In the Manual modes, the driver controls the gearshifts directly with the steering column-mounted gearshift paddles and the car operates as a true manual, holding each gear until it receives input from the driver. In Manual-Normal mode, the driver can shift until the redline while in Manual-Sport mode, the transmission will hold the gear until the driver changes, even if that means the engine hitting its rev limiter. In Sport mode, the GranTurismo Sport also contains the super-fast MC Auto Shift mode developed directly from the Quattroporte Sport GT S and capable of faster gearshift time up to 50%. This mode includes automatic blipping on the downshift along with a Launch Control system, called the MC Start Strategy (which only functions with the MSP switched off). Using the MC Start Strategy, drivers should hold the brake pedal down, press the accelerator until the engine reaches optimum launch rpm (between 2300-2500rpm) and release the brake pedal. Using this fast-starting system, the GranTurismo Sport will hit 100km/h in 4.8 seconds. The GranTurismo Sport has been engineered to give its occupants greater ride comfort than ever before, while also providing even more responsiveness in performance driving. Delivering a superb ride as well as extreme sporting grip and handling, it gives the GranTurismo Sport an allround ability found in few sports coupes. To achieve this, it uses Sport Skyhook damping, the latest evolution of Maserati’s damping control system. Sport Skyhook constantly adapts the GranTurismo Sport’s damping to suit the road surface beneath the GranTurismo Sport’s tyres. Combined with a 12 percent (+2mm) thicker rear stabilizer bar, the Sport Skyhook system can increase the GranTurismo Sport’s vertical stiffness by 10 percent in Sport mode. This system is a central part of a suspension containing double wishbone technology at all four corners of the car. This handling prowess is matched by the incredible stopping power expected of the company that pioneered dual-cast braking technology with its partner, Brembo. The GranTurismo Sport continues its use of the dual-cast system, with cast-iron discs attached to aluminum hats, which reduce unsprung weight by at least 15 percent. It uses cross-drilled and grooved brake discs combined with six-piston front brake calipers and four-piston rear calipers. 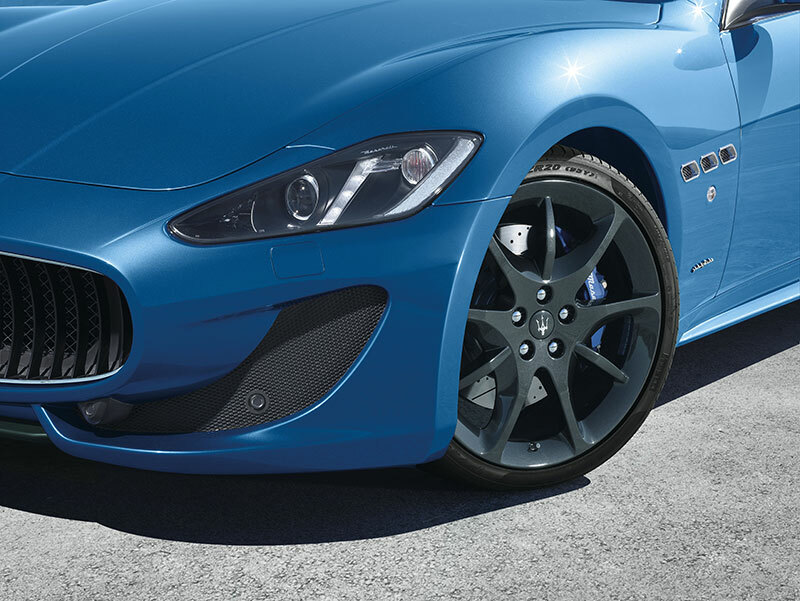 It also introduces a new anodized blue paint for the GranTurismo Sport’s brake calipers to emphasize its sporting nature.